Home / News / Christmas Gifts! Christmas is such a wonderful time to give and receive gifts. I often think for months and months for the perfect gift. When my kids were younger, it was so easy, I could just pick something up and they would love it. As my own are 12 and 8, it’s harder and harder. I have both girls so I can relate to what they are into. For boys, I would be clueless! Two friends of mine, thought my banners would be great gifts for their sons. 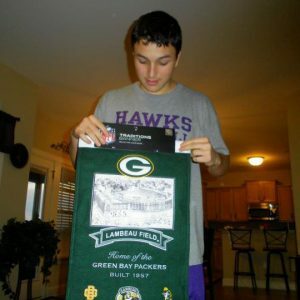 Laurie bought the New England Patriot – Gillette Stadium and Erica bought the Green Bay Packer – Lambeau Field. They wrapped them up and gave for Christmas morning. I had actually hand-signed Laurie’s banner, I have known her son since he was a baby. The boys were both very excited to have their favorite team banner for display in their preteen man caves. Thus far, I have completed 11 banners, and 8 of them are on the market now! Think Christmas gifts and more!